The No Confidence Motion against Mahinda Rajapaksa and the cabinet was passed for the second time amidst severe disruptions by UPFA MPs, a short while ago. The UPFA MPs staged a protest in the House without allowing the daily proceedings to take place. UPFA MP Arundika Fernando took over the Speaker’s Chair and prevented Speaker from conducting a vote by name. 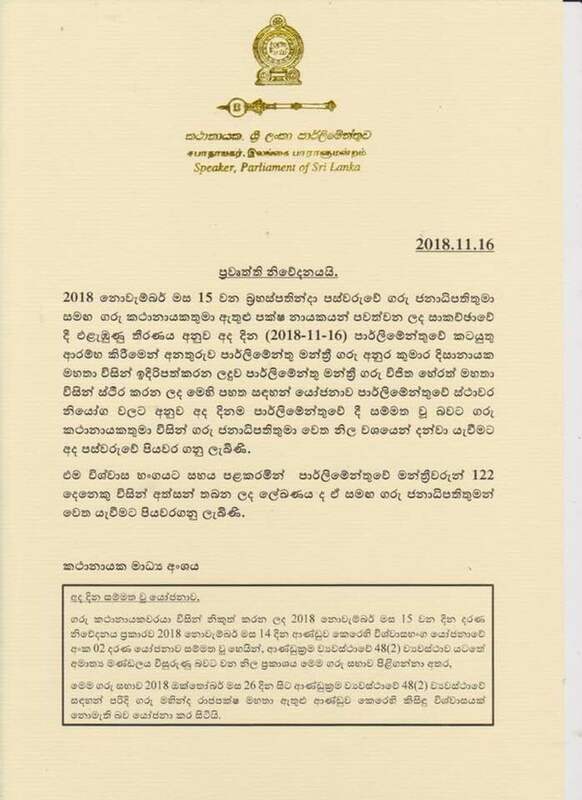 At that point, the Speaker conducted a voice vote, without the first clause of the No Confidence Motion against Rajapaksa moved by JVP two-days ago. Today it was again moved by the JVP. The Speaker was shielded by a large number of Police officers who entered into the House. The Speaker conducted the proceedings standing in the aisle, surrounded by a chain of officers guarding him and the mace. All MPs representing the UNP, the JVP and the TNA voted in favour of the No Confidence Motion while no one officially opposed it. The UPFA did not engage in the entire process and kept protesting.